As described in the Rose documentation (e.g. here), and as I've tried to illustrate with my 'pink bubble' drawing here, a Rose suite is a ‘container’ for apps. 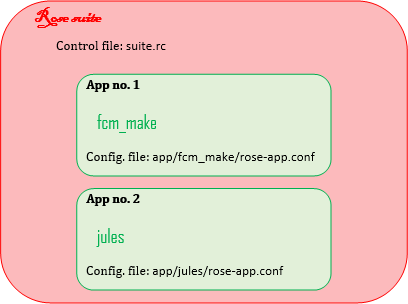 JULES Rose suites always have two apps that run sequentially: fcm_make (the compilation step) and jules (actually running the model). If you prefer to understand this in a more UNIX way, see screenshot right: the JULES Rose suite is simply a directory on your file system (at location $RSUITE in my notes) that contains some files (including the textfiles rose-suite.conf and suite.rc) and two subdirectories app/fcm_make/ and app/jules/. Kerry Smout-Day also illustrated the same structure nicely in her JULES tutorial here. How do I open/edit a Rose suite? If the path on UNIX to the top level directory of your suite is $RSUITE (i.e. if you do cd $RSUITE followed by ls then you'll see a file called "rose-suite.conf" and a directory called "app") then use a command like rose edit -C $RSUITE & . How do I know which version of JULES a particular suite is designed for? Either on UNIX look at the end of the first line of $RSUITE/app/jules/rose-app.conf or in Rose Edit look at the end of the 'meta' entry in fcm_make. Rose suites for running JULES are available either via the Rosie Go system or via the roses-u repository: see here for how to use those. How to compare two rose suites to see where they differ? On UNIX (usually from the ~/roses/ directory) use a command like xxdiff $RSUITE1/app/jules/rose-app.conf $RSUITE2/app/jules/rose-app.conf & (requires xxdiff to be installed on your system: if not, use diff instead but interface is not so nice). Or use xxdiff $RSUITE1 $RSUITE2 & if you want to see all differences including compiler options, etc. The suite.rc textfile controls how the apps of the suite relate to each other and the order in which they are run. You can specify complex and repeating runs of JULES using this (see e.g. here for using it to loop through a set of JULES runs with changing parameter settings). If you want to know more about how to use this, see the Suite Design Guide and/or Kerry Smout-Day's tutorials on the JULES manual pages. Finally, if you are still not convinced about Rose suites, there is still the option of running JULES using straight namelists rather than a Rose suite. See here for how to do that.